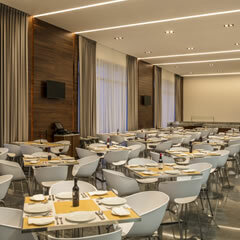 Fiesta Inn continues to evolve, transform, and innovate its Business Class hotel concept. With a fresh, modern image and new facilities, Fiesta Inn Chihuahua Fashion Mall is the perfect example of business accommodations done right. Designed to encourage creativity and productivity, the hotel’s spaces are functional yet friendly, allowing guests to be connected while remaining independent. Today's Fiesta Inn is more than simply a hotel-- it is a community of professionals who thrive on success. The hotel is located adjacent to the Fashion Mall shopping center and is just 10 minutes away from the Historic Downtown district. Guests can enjoy one of 156 rooms as well as the 360° Lounge, where they will find the La Isla restaurant, B-On business center, self-service area, and convenience store. Amenities include 24-hour room service, high-speed wireless Internet access, a fitness center, dry cleaning service, and secure parking. We welcome guests with service animals. 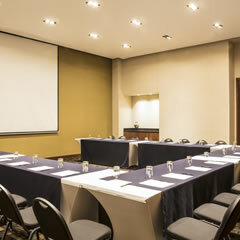 Fiesta Inn Chihuahua Fashion Mall is the perfect venue for a successful event. It has three rooms that can be configured to hold up to 160 people each, and each room is equipped with a whiteboard, projector, audio system, flip chart, and coffee break service. Combined with the personalized service offered by our trained staff, we have everything you need for a successful and productive event. "Rest is good, place seems unfinished"
The hotel is modern and nice but with unfinished areas still under repair. The shower drain was dirty with hairs and the shampoo bottle was empty, cleary not cleaned after the previous stay. The bed and the rest of the room was very comfortable. Enjoy a productive and restful stay in this comfortable room that features a king bed, executive desk with chair, telephone, wireless Internet, cable LCD TV, closet, coffeemaker, full bathroom, and air conditioning. This room has everything you need for a successful business trip and a relaxing stay. It is equipped with two queen beds, a closet, telephone, coffeemaker, wireless Internet, work desk with chair and lamp, air conditioning, cable LCD TV, full bathroom, and complimentary personal care items. This spacious, modern suite is the key to a successful stay and has everything guests need to work or relax comfortably. It includes a bedroom and a living room with a view of the city and excellent lighting. It features a king bed, work desk, closet, telephone, coffeemaker, wireless Internet, full bathroom, air conditioning, and cable LCD TV. In addition to the living room, this suite includes a dining room and unique decorations to make you feel right at home.